Thank you for your ongoing interest in and support for Mondo’s life-changing work. We’ve got some great news to share with you this month including: Mondo’s brand new website, our CEO Stephen’s first visit to our projects in Nepal, our new campaign to raise funds to support girls’ hostels in the region, and two important ‘save the dates’ for your diary! Mondo’s new website is live! The website has been re-designed to provide a much clearer picture of the work Mondo has been developing over the last decade as well as how we measure our impact. Please visit: mondofoundation.org and take a look around! As much of our work in Nepal, India and Tanzania falls under the priorities outlined in the UN Sustainable Development goals, we’ve started to profile the way in which we meet these broader outcomes under three of the Development Goals of Education, Gender Equality and Livelihoods. If you, or someone you know, may be interested to volunteer for one of the fantastic projects that we support, there is more information on our Volunteer pages where you can also hear from past volunteers about their adventures. Whether you’re a student, teacher or career breaker, we’d love to hear from you! Our Support Mondo page details the many ways you can support Mondo’s valuable work, from individual giving to partnerships. As reported in our last newsletter, Mondo has a new CEO, Stephen Carrick-Davies who over the last few months he has been working closely with Anthony in understanding all that Mondo is. Earlier this month, Stephen travelled to Nepal to visit some of the schools Mondo has built with our local partners. Stephen met with local colleagues and teams who are working hard to develop and improve livelihoods and education for young people in these remote parts of Nepal and the Himalayan Region of India. During his visit, Stephen experienced first hand the value and impact of Mondo’s work, not least in the phenomenal rebuilding work that has happened with the support of Mondo and its partners in the two years since the Nepal earthquakes of 2015. In the Helambu region north of Kathmandu we work with our partner HELP (the Helambu Education and Livelihoods Partnership). We are building schools by involving and training local villagers. By valuing their “sweat equity” they are becoming equal partners with us and the government in the construction and ownership of these new schools. Furthermore as we provide masonry training and equip them with building skills they are also able to transfer this knowledge as they set about the task of re-building their own more resilient homes. 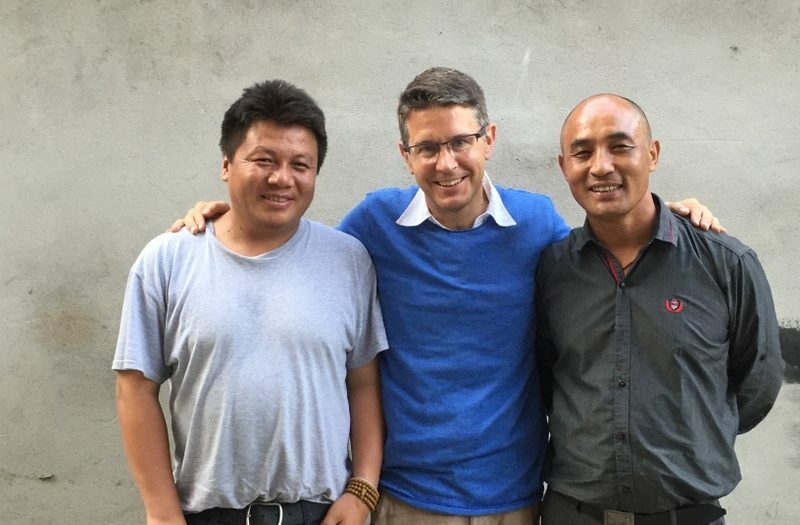 In the cover image you can see Stephen with two of our local partners, Jimmy (who is overseeing the school rebuilding work in Helambu) and Santa (who works with schools in the Kalimpong/ Darjeeling region to improve education programmes). How can we achieve gender equality in Helambu? We are not just building 15 new schools: with our partners we have sought to protect girls in the Helambu Valley by creating a number of girls’ hostels that allow girls to board close by to secondary schools. This helps reduce the large number of girls in the region who abandon their education after primary level as they do not have easy access to secondary schools. The more support girls have to stay in education, the less vulnerable they are to child marriages, trafficking and the cycle of poverty that reduced education and early pregnancy perpetuates. With greater levels of education, girls and women will be empowered to live healthy, productive lives and to push for further progress within their own communities. Click here to read a piece that Stephen wrote for Huffington Post, outlining the issues facing women and girls in Helambu, and the work that Mondo is doing towards addressing some of those issues. If you would like to support girls’ education in Nepal, please click here to donate to our current JustGiving campaign We’d also be delighted if you could share the campaign with anyone in your network who may have an interest in the work we’re doing. Any action you are able to take, however small, can make a huge difference to the young people we support in this region.One example of how a small amount of money can go a long way is Timbu Girls’ Hostel which was built with the support of Mondo in Partnership with HELP. Below is a short film that Stephen made about this wonderful hostel. You can also click here for more information about this fantastic flagship project. Thank you again for your continued support, and we look forward to staying in touch with you in 2017. What does it take to change a girl’s life?